Young Spanish designers are reclaiming their "Spanishness": age-old traditions, religious imagery and even the colour black, which centuries ago was a signature of the country's all-powerful monarchy. That is one of the messages at the "Modus" exhibition currently running in Madrid, which explores the influence of Spanish history and tradition on global fashion, including up-and-coming designers. "It's a very important moment (for Spain) with designers like Palomo Spain, Leandro Cano, ManeMane, who are reclaiming Spain's position in fashion," says exhibition curator Raul Marina. "Young designers are making noise again, and they're doing so via inspiration that is totally Spanish." Take black, a colour that has come to symbolise French chic as epitomised by Coco Chanel's 1920s little black dress. Its use in fashion actually originated in 16th century Spain. Before that, it had been a difficult colour to wear. After multiple washes or through constant use, the dye would just subside and turn into a greyish, brownish mush. But then Spain conquered the Americas, and more specifically Mexico in the 16th century. There Spaniards discovered a tree called logwood. It held a secret -- from its wood could be made an intense and lasting black dye. At the time, Spain was a major economic and political power. King Felipe II adopted that intense black as his own and the fashion statement soon spread. The monarchy was "a reference for all its European counterparts, as was its austere black gown which would become the expression of maximum elegance," Amalia Descalzo, an expert in clothing history at Spain's ISEM Fashion Business School, writes in the exhibition booklet. Foreign and Spanish designers like Cristobal Balenciaga embraced black in their creations and the younger guard are doing so too, in their own way. 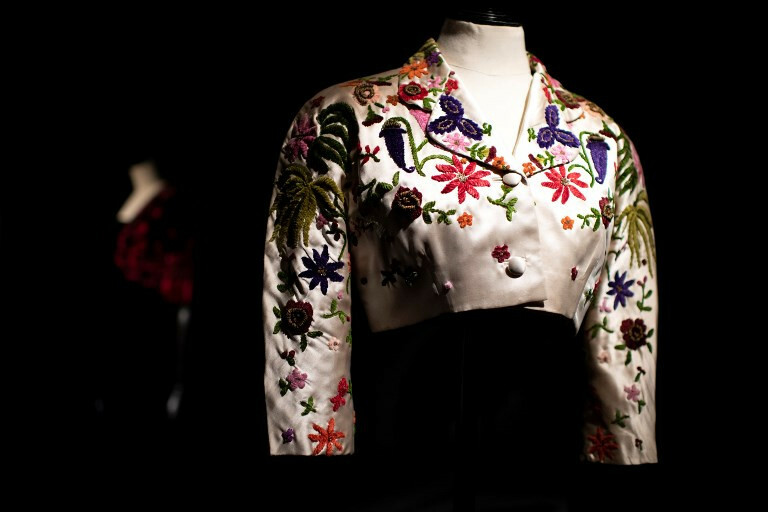 On show at Madrid's Sala Canal de Isabel II is ManeMane's black bodice and skirt, complete with a hat typical of the southwestern region of Extremadura, where brand founder Miguel Becer comes from. The same century that Spain promoted black, it also created the "verdugado", a structure worn under a skirt that held it into a fashionable shape. That fashion statement also spread Europe-wide. Later Spain unleashed another trend -- the "guardainfante", loosely translated as "infant-guard," side hoops that extended the skirt at the sides. "They said it hid ladies' pregnancies," says Marina. The quirky "guardainfante" was famously immortalised in painter Diego Velazquez's masterpiece "Las Meninas." That influence is visible in Juanjo Oliva's yellow, bell-shaped velvet dress, on show in the exhibit. Then come Spain's world-famous exports -- flamenco and bullfighting have inspired designers from other countries. A Givenchy bullfighting-style jacket made out of black velvet with arabesque-like red embroideries and pearls. A black Lanvin dress with a cascade of ruffles and cream-coloured polka dots inspired by southern Andalusia's flamenco tradition. "It's often said that internationally, foreign designers have soaked up and felt prouder about Spanishness than us," says Marina. But that's changing, he adds. Religion, tradition are making a comeback. Palomo Spain, whose flowery gown was worn by Beyonce in July 2017 for her first shot with her newborn twins, has a short white silk dress with a halo-shaped headdress on show. Leandro Cano's white tutu-shaped dress with flower prints -- as once worn by Lady Gaga -- takes inspiration from the reign of King Felipe III. ManeMane's creations on show are influenced by craftwork from Extremadura. Fashion consultant Marta Blanco says there is an "awakening" in an industry she feels was marked by a sense that "anything Spanish harked back to the Franco regime." But 43 years after the death of right-wing dictator Francisco Franco, that's waning. "Someone like Leandro Cano can get inspiration from Spanish bullfighting, from religious imagery... without it evoking fascism," says Blanco. She believes there is also an "awakening" among Spanish consumers who feel "pride" in their country. "That creates empowerment," says Blanco. "Ferran Adria took away our insecurities, and now it's happening in fashion."